I love my canning jars. 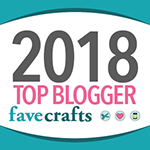 For drinking glasses, storage and organization, emergency vases, candle holders, gift giving… they are wonderfully versatile and as Eco-friendly as it gets. So you can imagine how excited I was when my friend Dawn at Midlife Flourish purchased a Cuppow and came to me for a set of custom cozies! And once I’d written down the pattern, I decided to share. The Cuppow turns any wide mouth canning jar into a travel mug, and works with both hot and cold drinks. But it doesn’t take care of condensation from cold drinks or scalded hands from hot drinks – that’s where the cozies come in! 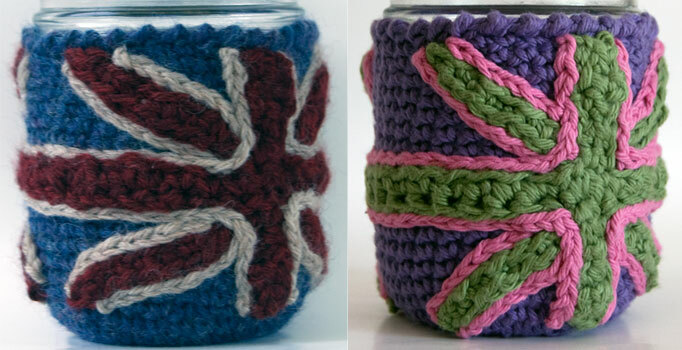 For this commission I made one in wool for hot drinks and one in cotton for cold drinks. 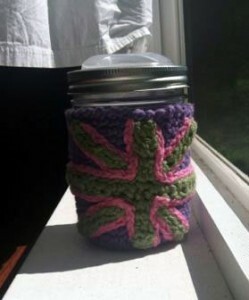 I used a plain background stitch of single crochets and improvised a Union Jack pattern. Voila! In addition, I worked up a pattern that used a more decorative stitch. 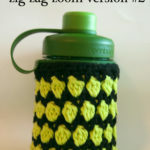 I decided to share the two basic cozy patterns: a Plain Version – perfect as a backdrop for your own add-ons, and a Decorative Version – great for showing off a pretty yarn or letting your drink peek through. And from there you can customize them all you like. 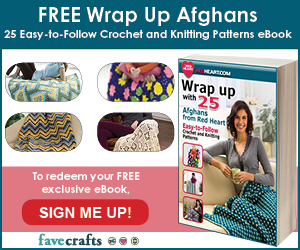 Add an applique, go crazy with color, sew on a club patch or cute buttons – it’s up to you! Row 1: Make a magic circle and work 6 sc into the circle. Join with sl st and ch 1. Row 2: Work 2sc in ea st around. (12 sc) Join with sl st and ch 1. Row 3: *Sc in st, 2sc in next st. Repeat from * to end. (18 sc) Join with sl st and ch 1. Row 4: *Sc in two sts, 2sc in next st. Repeat from * to end. (24 sc) Join with sl st and ch 1. Row 5: *Sc in st, 2sc in next st, sc in next two sts. Repeat from * to end. (30 sc) Join with sl st and ch 1. Row 6: Work just this row in the blo. [Sc in nine sts, sc2 in next st] three times. (33 sc) Join with sl st and ch 1. Row 7: Sc evenly around. (33 sc) Join with sl st and ch 1. Row 8 – 20: Sc evenly around. (33sc) Join with sl st and ch 1. You may need to add rows here to reach the top of your jar or to account for your own gauge. I found that with cotton I needed just 20 rows, but with the wool I needed 22. So try it on the jar and see where you’re at before moving to the last row. Row 21 (or last row): Work RSC to the end of the row. Break yarn and finish off. Weave in ends. Row 6: Work just this row in the blo. [Sc in fourteen sts, sc2 in next st] twice. (32 sc) Join with sl st and ch 1. Row 7 – 16: *Work a sc and a dc in the same st. Sk next st. Repeat from * to end. (16 clusters, or 32 sts made.) Join with sl st and ch 1. You may need to add or subtract rows here to account for your own gauge. So try it on the jar and see where you’re at before moving to the last row. Row 17 (or last row): Work RSC to the end of the row. Break yarn and finish off. Weave in ends. Now you add any decorations you like, or just slip in on your jar and get to sipping! 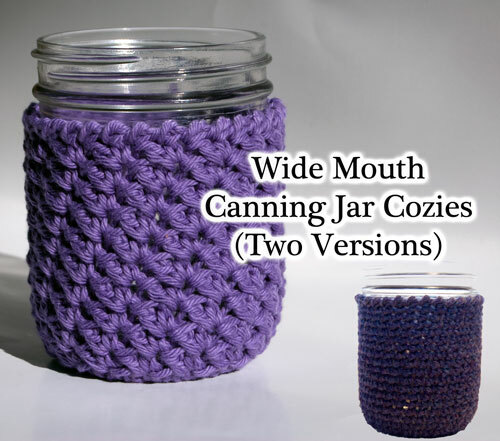 As one of the canning jar obsessed, I might have to add the Cuppow to my wish list. I already got my new clothesline for Mother’s Day, so I think this is next on my list. Do you use love canning jars too? What else do you do to be green? Thanks Bari Jo! These are for the wide mouth 16oz, but I believe they’d work for quart size if you just added rows til you get to the top. 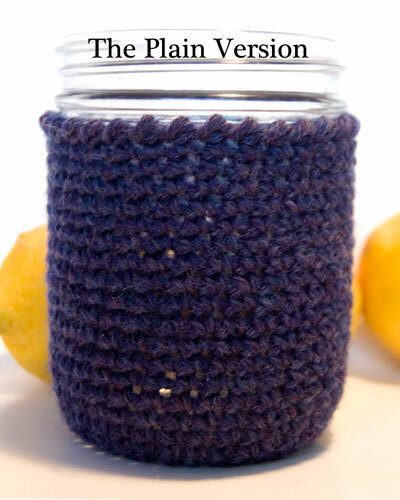 For smaller jars, just work the bottom as instructed until it’s slightly smaller than the base of the jar you’re crocheting for. If you are making the decorative version, then work a blo row with 2 increases (one in the middle, another at the end) or one increase, whichever gives you an even number of stitches around. Then work on up the sides as instructed! For the plain version, work 3 increases in the blo row, spaced evenly, and then go on up the sides. 🙂 Hope this helps! Let me know if that’s not clear! De Ja Vue!!!! I made these about a hundred years ago (give or take 70 or so) for the same purpose. I still use them today (yep they lasted that long and they’re still in good shape) when I have an iced whatever so that the condensation doesn’t get everything wet. I had visited my brother & fam. and my sister-in-law served an iced drink in a glass that had a CLOTH one on it. A friend had made some for her. 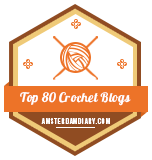 So…I decided to work up some in crochet.– and did. The ones she had were for regular glassware, but mine were for pint sized canning jars and were very similar to your “Plain Version” (but without decorative picots). I’m glad to see the idea has had a come-back. Woo-Hooo. Like they say, everything comes around, eh? Thanks for commenting JJ! Muchísimas gracias …. son muy lindos ! What is a “magic circle”? WOW what timing. I just ordered some Cuppow lids and some pour lids to put on half gallon wide mouth Mason jars today from Amazon.. I plan on making suntea in the half gallon jars and use the 16oz for drinking but may have to use the cozy on even the half gallon mason jar to help prevent it from slipping out of my hands. Looking forward to starting on these tomorrow. Thank you so much for sharing your pattern. Hi Chris! I can only speak for myself, but if they’re made of kitchen cotton then they should be washing machine safe. However, since driers can shrink cotton, letting them air dry would be a good idea (unless yours ended up a little too big to begin with). With wool, it just depends on what kind of wool you used. All that said, handwashing will prolong the life of any handmade item. 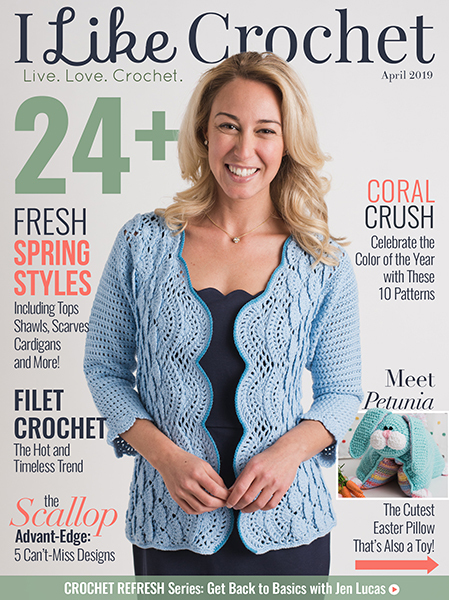 Love the pattern but can’t figure out what blo (below maybe) and RSC are intials for. Thank You for the pattern. I”m just wondering what you did to make the Union Jacks. I love my Cuppow’s and I ordered some for my sister-in-law for Christmas and I’d love to make her a British cozy to go along with the lids. Thanks! Hi Conni! They were completely improvised – just basically 2 rows of sc sts, with sl st edging. I wish in retrospect I’d written it down! I love this pattern. 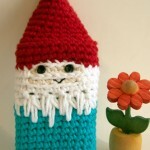 I made one as a Chirstmas present (for my Cuppow loving husband) and am working on the tall version now. The decorative version is my favorite. 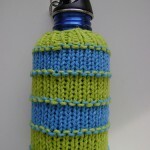 I crochet a little tightly so I had to extend the base a little and luckily I managed to draw a picture and figure out how to do it:) I’d like to try to use a similar pattern to go around a little coffee carafe that we have. I just need to figure out how to make room for the handle. Thanks for sharing. Put loops on edges where the two sides meet on either side of handles, measuring the distance above, between and below, with width of handle left open. 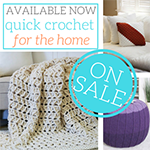 Crochet loops with a chain length needed and slip stitch or single crochet back to beginning of chain, fasten off leaving threads to use to attach loops, this should be about twice the distance to and around your choice of button, attach both ends on under side of cosy around handle. My French press only needed 2 loops inside the handle area. Sew your buttons matching loops, checking to make sure you will have a snug fit. I personally would sew buttons on first so I could make the loops to fit the reach to, around buttons and back to edge. Hope you can follow this, take one step at a time. Thanks for the pattern! I’ve spent over 2 months looking for one with a more pretty stitch. Perfect! I LOVE this pattern! 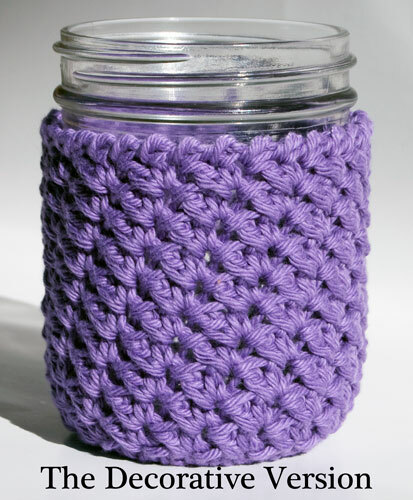 I made a cozy for my canning jar that I normally drink out of so that it wouldn’t sweat all over the place – no coaster needed! Now I’m excited to make more and also now be able to drink hot drinks out of mason jars (just purchased a lid to turn jars into travel mugs) and take them on the road and not burn my hands off. 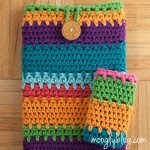 I used the decorative pattern and Sugar n Cream cotton yarn and it is so cute – I get comments on it all the time. Thank you so much for the pattern! I have seen the magic circle mentioned in several patterns, but guess I missed the original pattern showing what it is. 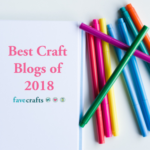 Love getting your Moogly blog. A former Davenport Iowan who transferred to Tucson Arizona. 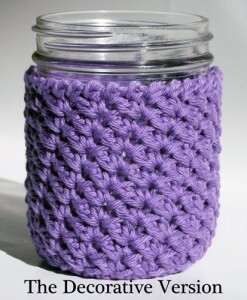 I have made similar cotton yarn cozies for the large jar candles sold at Michael’s. When the candle is lit the light shines through very prettily. I plan to use your pattern the next time I give the candles as gifts. Thank you for sharing.